This article was originally written on July 14, 2010 but today’s topic was someone of something that has had a huge impact on my life. It was my dog, Ineka. It is with a sad heart that I have to report that our dear friend, Ineka passed on yesterday, July 13, 2010. I want to personally thank all of our friends, family and fans that sent such kind words and support during this difficult time in our lives. It is funny how dogs affect our lives like they do. Ineka touched so many lives in is ten years with us and I want to share his story as a tribute to him and all those he made smile. It was a cold and snowy morning in Denver in March of 2000 when Michele and I arrived at the cargo area at Denver International Airport. We were picking up a dog that we had rescued from a foster family in Washington State. We were expecting a white Siberian but we were mistaken, it was a striking black and white male with ice blue eyes and missing one of his long canine teeth. In 2000, email was not the preferred communication medium yet and Facebook was not even heard of, so when we contacted the foster family in Washington it was almost by accident. While we shared many email messages and phone calls and when Ineka arrived we had no idea that this dog would change our lives forever. We had already named Ineka before his arrival. His name, pronounced (IN-eck-A) means rescued friend in a Northern Native American dialect and he truly lived up to it as soon as he arrived. Michele and I loaded our new dog, who was supposedly four at the time (but we soon found out through a dental exam he was closer to two) and drove up the mountains to our Bailey, Colorado home. We were in the process of starting training for an Iditarod attempt in 2003 but I had not moved here full time yet from Minnesota and our dogs were just beginning their racing careers. I guess you can say that we were a work in progress. We had a rough and tumble batch of Siberians in Colorado, most of them rescues and B-team members from other mushers. We had started training on the cart on the dirt roads in our neighborhood and when we arrived with Ineka we were thankful for the fresh snow on the ground. We hooked up a team of Siberians and off we went through the Smokey Mountains. But for some reason Ineka was different. He captured my heart from that first day and we quickly decided that he would be the house dog. This holds a special place for a sled dog because many never get to feel the comforts of laying in front of the fireplace or an occasional scrap from the family leftovers. The next morning, we took the dogs out of the kennel, put them in harness and hooked them up for a run in the fresh snow. We brought Ineka out and put on a black harness and he went wild. I am a firm believer that Siberians were born to pull and Ineka was no different. We hooked him up into team position right in front of the wheel dogs and away we went down the road. Ineka was a natural. He pulled like he had been doing it for years. When I barked out the commands: Gee and Haw and Hike and Whoa his ears turned back like he knew what I was talking about. Could this dog have been a sled dog in is previous life? Could he be a lead dog too? Within days Ineka was settled into his new home and quickly became what we called him for the rest of his days–Sergeant Ineka. He was the Sergeant of the kennel constantly breaking up scuffles and keeping the dogs in line when they chose to goof off. Ineka seemed to possess that rare trait of a true alpa dog and for what ever reason every dog that approached him showed him the utmost respect. Its hard to describe in words but if you have seen it you know what I mean. The days passed with me working in the office and training in the night hours with Michele and the kids following me in the van while I was traveling at break-neck speeds on a three wheeled cart on a sheet of ice. What stories I could tell. After our runs I would always go to the fridge that we had in our basement where I kept my cheese stash and Ineka and I would share a hunk. I quickly learned that cheese, pizza and spaghetti were his favorites and we made it a point of our daily ritual all the way up until the day he passed. Over the next few months, spanning through the summer and into the fall and early snow of winter, Ineka was placed in all the positions in the teams, both the A-Team and our B-Team of ragamuffins and he seemed to excel at all of them. He soon began running in lead and training puppies to learn the ropes in harness. That winter we started running our first races as a team and didn’t do well. I had always been a mid-distance musher and ran, mostly recreationally in Minnesota up to 45 miles at a stretch. I had no idea how to train or run a sprint race and we were sorely beaten by every team. But it sure was fun! We introduced our three kids: Kyle, who was eight at the time, Tyler (5) and Nicole (3). While Kyle and Tyler were away at school Nicole would help out in the kennel and Ineka was always there to protect her from the other dogs should they come to close. Nicole was introduced into the dog training world and quickly became quite the little handler. All three of the kids ran races that first year with Nicole competing in a 100-yard dash with her “lead dog” Tamaya. Over the years we got out of mushing for what I like to call “life getting in the way” and Michele taking a job in Denver as a paralegal. I was completing my doctorate research and was soon defending my work for my dissertation: Chasing the Dream: A Study of Human-Canine Communication in the Sport of Dog Sledding. I moved full time to Denver in October 2006 and joined Michele and the kids and soon opened Denver Dog Works. Upon opening Denver Dog Works Ineka would come to work with me every day and he would continue his task of keeping all the dogs in line during playtime in the dog yard and we used him constantly in our growl classes and any time we needed a dog to demonstrate with or be a decoy for. He earned his keep and was paid handsomely in cheese and affection. About this time Michele grew tired of the mundane work of a paralegal of a big time law firm and soon quit to work with me full time at Denver Dog Works. She began to utilize Ineka as a “therapy dog” when we found that he had tremendous patience with a gaggle of kids during our sled dog presentations at local elementary schools. In July 2009 we moved into our new location on Parker Road and Ineka was starting to show signs that he was not feeling well. After numerous trips to the veterinarian we concluded that he was most likely suffering from an illness closely related to Alzheimer’s, commonly called canine dementia. Ineka didn’t go to work with us much any more, but my tasks had changed a bit and I spent more time at my home office promoting Denver Dog Works and our new business Twine Group Media, a publishing company for my new book, Run With Poodles. I spent my mornings with Ineka by my side until the symptoms of his illness started to worsen. The most visible were the almost constant pacing and inability to settle down. In the fall of 2009 my vigor for running the Iditarod re-surfaced having invited veteran Iditarod musher, Hugh Neff to speak at my daughters middle school. After the school talk Hugh and I had breakfast at a local restaurant and talked dogs. I told him of my intentions and we agreed to stay in touch. In March of 2010, I was in Anchorage for a conference put on by Chris Fuller of Iditarod Leadership and I met Hugh for the ceremonial start. I am eternally grateful for Hugh allowing me the chance to handle for his team and to see him off on this latest attempt at the Last Great Race. I met a realtor while up in Alaska and exchanged information. Over the spring my motivation was to do what ever I could to start the process of training for the Iditarod again. I had decided to name my team after my good buddy and run from this point forward under the Team Ineka banner. Michele and I had decided long ago that if Ineka could not be at the finish line when I crossed under the burled arch in Nome that we would spread his ashes along the Iditarod trail. The next few months took me to Minnesota, California and Alaska (twice) looking for a property that would allow us to build our dream and have the ability to run sled dogs again. Living in the suburbs of Denver with a yard that you could literally spit across and an HOA restriction of just three dogs and absolutely no barking, it was time to move. On a whim I contacted my realtor friend in Alaska and he found me a place. It is an Iditarod veterans home that is within miles of the official start of the Iditarod in Willow, Alaska. My daughter and I flew up over the Fourth of July weekend and started the process of buying the place. On Monday July 12, we officially signed the paperwork to own the home in Alaska. Later that day, some time while we were all at work, we think that Ineka suffered a stroke. When we returned home he could lift his head but he seemed to be paralyzed. One of his eyes was dilated and would not retract. I spent the night with him on the floor of our bedroom and cried while holding him in my arms. By the next morning Ineka had gotten progressively worse and we decided to take him to our vet, Dr. Holly Cogswell of Aurora Animal hospital. We had decided long ago that we wanted to make Ineka’s last days as comfortable as possible and not to intervene with treatments that would most likely just make him more sick. By this time his dementia had gotten worse and we think he had cancer on his thyroid. We spoke many times to Dr. Cogswell and we had her on our radio show to talk about Canine Dementia. We felt that the only person in the world that could guide us in our time of need was Dr. Cogswell. Ineka passed over the rainbow bridge at our veterinarian, and also now our dear friend, Dr. Cogswell’s office. Michele, Tyler, and Nicole took Ineka inside and stayed with him during his passover. Tyler was steady and strong for his mom and little sister, but eventually broke down. Ineka had been their best friend for 11 years of their short lives. That afternoon I was a wreck and I could hardly contain my emotions. It is funny how much our dogs hold on to our heartstrings so tight. I drove to Camp Hale near Leadville, Colorado, almost 140 miles from our Denver home. The site of our first sled dog race in Colorado and officially the start of the Team Ineka legacy. I performed a Native American ceremony for my dear friend helping him cross safely into the spirit world. I was amazed how vigorously I sang the songs and how much passion I had in my voice. I hadn’t sung those songs in years and it was like I read the lyrics yesterday. I quickly emailed my good friend, Sid Korpi in Minnesota that had recently wrote a book on pet loss: Good Grief: Finding Peace after Pet Loss. She and I corresponded many times over email that day and she had emphasized that pets have an uncanny ability to know when it is time to go. Ineka did. In August I will be heading to Alaska to start my racing kennel with hopes of running the Iditarod in 2013 under the Team Ineka banner. It is just something I have to do. I have thought about it since that first day with a dog team in those Georgia mountains. I know a lot of mushers have that dream and many pursue it. Many call it the Musher’s Bug. Once it gets in your veins its hard to contain. My plan (at least for now) is to stay in Alaska six months a year and the other months in Denver. We plan to keep Denver Dog Works in operation and spend our summers here at least until Nicole, now 13 and wanting to be a veterinarian, (do you think those early years in the kennel had anything to do with it?) goes to college. It will take me at least a year to get the house in order up there. It is truly a musher’s cabin with a working outhouse (that we can use in an emergency, if we need to) and high speed Internet. All the luxuries of home right? But I have tremendous drive and motivation but no carpentry skills. Luckily there is DIY Network on DirectTV. Michele and the kids will stay back while this chapter of our lives continues to be written. But one thing is for sure, Ineka’s spirit is in our hearts. Being so close to the Iditarod trail will allow me to fulfill my promise to spread my rescued friend’s ashes in the spot that we have talked so much about over the years and then Ineka’s spirit will make the stars shine just a little brighter to guide all of us on our way to never forgetting your dreams. 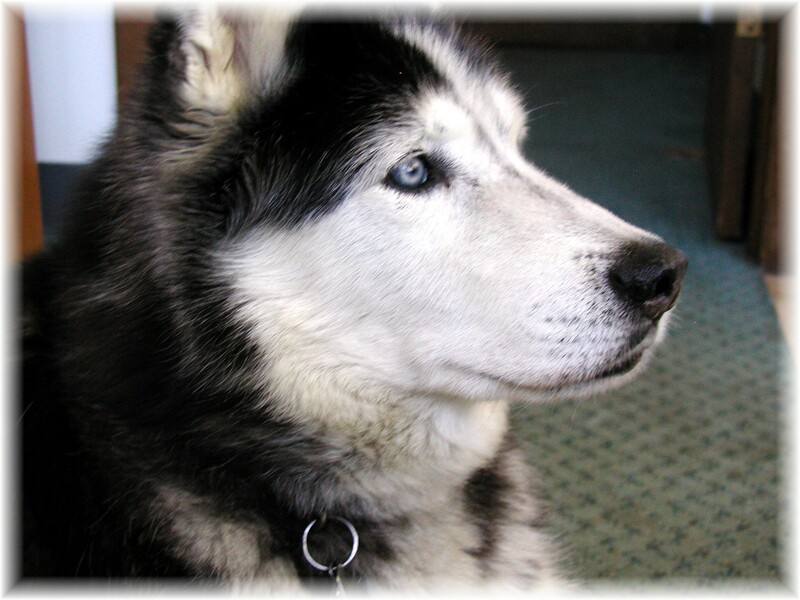 On this day Ineka, my dear friend, wear your silver harness with pride and we will see you on the trail. I am truly saddened and sorry to learn of Ineka’s passing. I sit here and write this with tears filling my eyes after watching your beautiful tribute and reading your story. Ineka will always be filled with your love and you with his as he watches you and guides you in your dreams of the Iditarod from beyond the Rainbow Bridge. Our thoughts and Husky hugs are with you. His spirit will carry on always through Team Ineka. Thank you for your comment, Dorothy. What a beautiful tribute to a beautiful dog. I am in tears as I write this. Husky hugs to you. What a beautiful story. Dogs truly touch our lives in special ways. Your dog looks so similar to our Shilo. We got her from a rescue. She has epilepsy and just had both her knees operated on. She is 6 years old. She is the joy of our lives. The most gentle soul you could imagine. We take her to nursing homes and little kids always run up to her and pet her and she is always calm, patient and just lets everyone pet her and kiss her. She is wobbly from her seizure meds, but can still run and play. We would love to move to Alaska and have a bunch of huskies….we love them! How do you like living in Alaska? Is it what you had hoped it would be? Thank you so much for your comment and sharing the story about your dog. Yes, the all hold a special place in our hearts. I love living in Alaska and chasing these crazy mushing dreams! It took awhile to get used to being 45 minutes away from the grocery and an hour to the big city but it is great. I hope you continue reading my blog. I always welcome comments and suggestions. what a great way to keep Ineka’s spirit alive :] my dog is my best friend…can’t imagine life without him. great post, thanks for sharing! I write to you a total stranger after having received a link to your youtube memorial video for Ineka – also from a total stranger – save for the fact that Huskies have bound our spirits together in a way only Huskies seem to do. I am a co-mom to 4 of these beauties and cannot remember life before them. And would not change it for a thing!!!! Thank you so much for taking the time to comment on my post. Yes, Ineka was a special dog. What a sweet post! Dog lovers totally adopt their dogs as a family member, not just a dog! I have lost two dogs in the past two years and it was beyond awful 🙁 Ineka sounds just fantastic!